Percy Hughes (1872-1952) was a professor of Philosophy, Education and Psychology at Lehigh from 1907-1942. From women's rights to environmentalism, Hughes devoted his life to historically progressive ideas. Prior to coming to Lehigh, Hughes helped set up a primary school gardening course, an early attempt at linking education with environmental practice. During his Lehigh tenure, Hughes planted tens of thousands of trees in New Jersey. He believed strongly in conservation and natural resource protection. 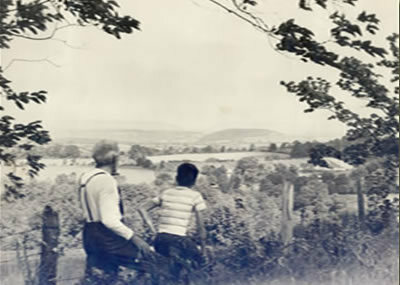 In this picture, Hughes is overlooking some land in New Jersey. He is standing with his son Albert, who went to Lehigh but eventually transferred because Lehigh did not have a forestry major. Upon graduation, Albert spent his entire career in the forestry service. The papers of Percy Hughes, donated by his daughter Elizabeth Hughes Clark, are available for research in Lehigh's Special Collections.